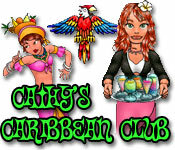 Cathy's Caribbean Club is rated 3.7 out of 5 by 3. Rated 5 out of 5 by tailswhiskers from My first game I bought without playing first I never buy a game without trying it first, but this game did not have a free 60 mins. so I brought it and I am glad I did. I am enjoying it a lot. There are 3 different levels to choose from. If you want a fun game to play this is it. I would recommend this game. Rated 3 out of 5 by SylvanNun from This game still exists?! I'm just starting to get into writing reviews for games I've played on Big Fish and looked at some of the older ones I've had in my purchase history. I lol'd when I saw that this game was even available still to purchase. It is a super old one and starts out actually being somewhat fun to play. The graphics are pretty terrible which really isn't an excuse because it's an older game- the way they designed the people/characters is like HUH?! But that's also one of the reasons I've come back to play it again...just because the characters are super-bizarre. A strange-looking dude will be sitting next to a werewolf who will be sitting next to a vampire and the list goes on. Not sure what kind of bar at what kind of beach this is but I'd stay away more so from the way the people look than the animal characters do. Along with the design is the uh..."sound acting" that comes along with it. Indistinguishable noises that sound like "arugula!" "ha bid ah" "uh-uh" "uh top uh voo" and "buh bup" replace real voices which I find hysterical. The game goes on for way too long and could've definitely been chopped down by a lot. You use up all of the items to buy mid-way through the game and though you keep earning money, there's nothing left to spend it on. Still- it's a pretty funny game to experience at least one time. I'd recommend you just download the trial to have a laugh and move on. Rated 3 out of 5 by Pucktweety from Good! This game is years old and like most games you can tell. The graphics are quite poor and the game play isn't as smooth as others, but it still a lot of fun. You are literally a bartender and you serve drinks after making them up. It can be quite slow start with and even some of the harder levels can be slow for me, but it does get quite challenging near the end.